I provide a comprehensive service for riders interested in shopping for sport horses outside the US. My services begin at home with a meeting and riding evaluation to understand the client's needs and to make sure that we all agree on realistic goals for the type and price range of horse. Once we have listed the criteria for the desired horse, I begin communicating with my contacts to determine the availability and location of likely prospects, ensuring a more efficient trip, and reducing the frustration and unnecessary travel expenses which can occur without such preparation. During the trip I handle all travel arrangements and logistics in keeping with the client's tastes and budget. During each farm visit I help my clients evaluate the horses we are shown by the sellers, discussing compatibility and talent, any potential problems noticed, and the overall suitability to help the client achieve the stated goals, acting as a reality check where appropriate. Once a suitable horse is located and transaction recorded, I assist in arranging for a veterinary examination, and arrange for transporting the horse to the client's home stable. Pierre is truly the most honest and responsible and interesting person I know. I think it is his refreshingly open and direct way of talking with people that helps him have such good relationships with not only his clients, but also his horse buying contacts in Europe. Pierre is focused on long term high quality business, not short-term gains, and so he chooses only reputable contacts who respect and share his ideals. Pierre takes great care in knowing his clients' needs, desires and experience so that he is able to find and provide the most appropriate selection of horses from which to choose. He is sensitive to even subtle issues with the horses' soundness, temperament and training. 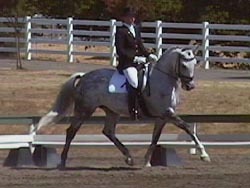 As an accomplished rider and trainer, he can evaluate the horses' rideability and help the client evaluate the horses as they ride. He offers additional insight by videotaping clients riding prospective horses and then reviewing the tapes with them. In short, he makes every effort to make sure that no horse is purchased unless the client has a very high chance of reaching the stated goals with it. Pierre is an excellent negotiator. I could buy another horse with the money he saved me in buying five horses with him as my agent. Perhaps one of his best qualities as an agent is that he would rather not make a sale than recommend a horse he feels would not be a good match for the client. That said, he does always seem to be able to find the perfect match. Pamela Vendetti & "Absolute Joy"
As a committed amateur dressage rider, I knew I faced a few challenges when I began looking for that special horse. 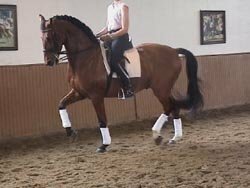 It was very important to me that this horse be a beautiful, athletic mover with three excellent gaits, but there were two other qualities that were even more important to me. First, this horse had to have an excellent mind and temperament, that "special something" that creates a true partnership. Second, the horse needed to have all of this in a smaller package. I'm a petite woman and I wanted large horse movement in a smaller version. I guess I wanted it all; great temperament, great movement, great size. A tall order maybe, but my dreams came true with 'Joey', a Hannoverian gelding that Pierre found on a trip to Germany. Pierre has an amazing eye for really great horses for which I have great respect. Equally impressive is his ability to match horse and rider in style and temperament. Pierre truely cares about his clients' needs. Joey, or Absolute Joy (his registered name), lives up to his name in every way. He truly is an absolute joy. This wonderful horse is everything I wanted and more. I've always dreamed I would own such a horse of breathtaking beauty and movement who is also my best friend. Even better, Joey was within my budget and my dreams became a reality. If I am again in the market for a horse, I would not hesitate to work with Pierre. First hand, I've seen horses Pierre has found for other clients and their stories of success are similar to my own. 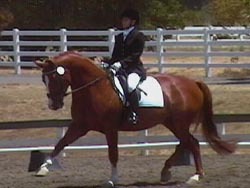 I highly recommend Pierre to anyone wishing to experience dressage at its best. 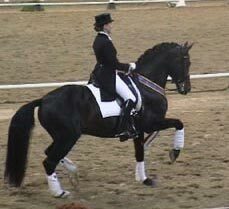 Kimberly Cook and Dazzling FEI Mare "Promenade"
I thoroughly enjoyed our trip to Germany. It was a pleasure to travel with you, and I truly appreciated all the work that you did to organize the trip. The nature of a horse-shopping trip is such that most of the direction of the trip changes day to day and it was wonderful to have you and your file of contacts available to make plans and hotel arrangements at just a moment's notice. It made it all so easy for me. Then there was the horse shopping part of the trip, (the best part). Your contacts were all wonderful people to work with, honest and helpful, even when they did not have just the right horse for me; they made calls and helped all that they could We looked at so many horses, and most of them exactly fit the description of the type of horse that I was looking for. It was also a pleasure that they were all in my price range, with no pressure to spend more than I wanted. Your knowledge and assessment of each of the horses was an invaluable tool in making the right decision. All in all it was a great trip and now I await the horse of my dreams! Please feel free to give out my name and number as a referral, anyone that chooses to partake of your services is in good hands. Linda Roan & FEI Schoolmaster "Navarro"
I wanted to take this opportunity to thank you for helping me find the horse of my dreams. My beautiful Navaro is really so special that I can hardly believe that I have him. He delights me on a daily basis. Horse shopping with you in Germany was a delightful experience. Your priority of assessing the horse in terms of safety and compatibility for me was truly appreciated. Also, you consistently tried to look at only horses that fit the description of what I was looking for. You are such a planner that I felt everything was taken care of even at a moments notice you were able to switch directions and make any necessary arrangements. Please give my name and number to anyone who is considering using your services. I can not recommend you highly enough. It was an absolute pleasure.